1. Prepare rice as usual. I made mine in the rice cooker, but Bonnie recommends the following: Rinse rice in several changes of water until water runs clear. Drain well. In a medium heavy pot, combine rice and 2 1/4 cups cold water. Allow to rest for 15-30 minutes. Bring rice to a boil, covered, on medium-high heat. Boil for 1 minute. Reduce heat to low and cook for another 10 minutes. Do not lift lid at any time during cooking and resting. 2. Combine rice vinegar with salt and sugar and stir until dissolved. 3. While still hot, transfer rice to large bowl and gently toss with vinegar mixture. Fold the vinegar in, do not mix. It should look like it has a glaze on top of the rice. Cover rice with damp towel if not using right away. 4. Line an 8-inch square baking dish with plastic wrap. Arrange cucumber slices in a single layer on bottom (or overlap them for more cucumber goodness). Arrange smoked salmon slices on top of cucumber. Combine mustard and mayonnaise/yogurt and spread over salmon. 5. 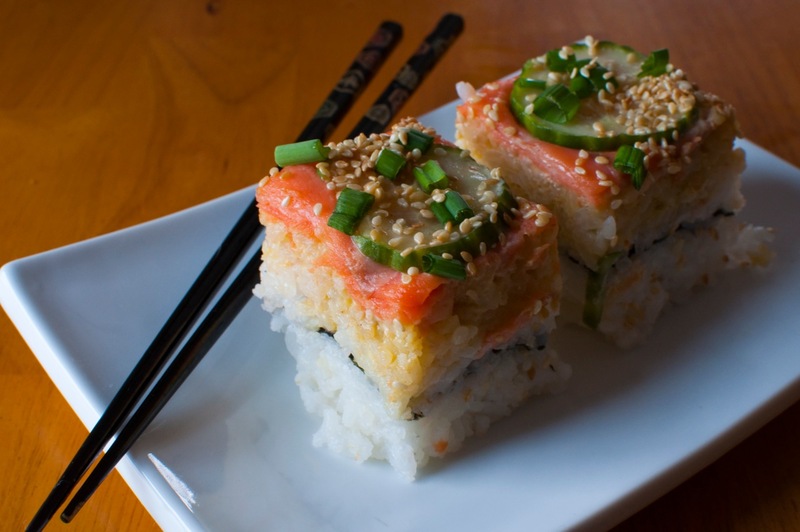 Gently and carefully spread half the sushi rice on top of the salmon. Dip your fingers into a bowl of water and gently pat down the rice. Place square of nori on top of rice, cutting it if it does not fit perfectly. Pat on remaining rice. Cover with plastic wrap and weigh down with several heavy cans of food for at least 30 minutes. 6. To serve, unwrap and invert onto a square serving platter. Sprinkle with chives and sesame seeds. Cut into small squares. I think managing the mixed diet household is a lot easier than people expect, as long as everyone is respectful of each others’ choices. I eat meat; my person doesn’t; it essentially makes no difference to us. I eat a lot of vegetarian & vegan food (both with him and just whenever) and he occasionally gets excited and makes me a special meat something-or-other. Granted, he’s obviously at zero on the squeamishness around meat scale, but I would be fine with only eating meat when I made it myself and/or at restaurants or other people’s houses if that were an issue. No big deal–I respect his choices, and he respects mine. wow that looks absolutely delicious!! and a beautiful presentation! thanks for sharing! This makes me want sushi. Right now. For breakfast. Looks so good!